Engineering students gathered to receive exclusive access to the Sonos API and smart speakers. University of Washington engineering and design students gathered to receive exclusive access to the Sonos API and smart speakers. These students are the first to receive this level of professional developer access. In the past, only companies like Pandora and Spotify have been able to secure this opportunity. 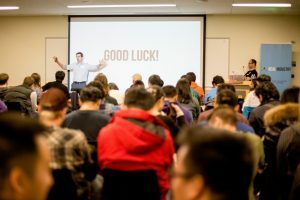 Sonos, the home sound system developer, presented students with a design challenge to build smart speaker experiences that improve the moments in someone’s daily life. Real Industry, an organization that partners with companies to create workshops to help students develop real-world skills under the guidance of industry experts, chose UW EE as a top collaborator. UW Electrical Engineering Professor Les Atlas collaborated with Sonos to recruit students to participate in the challenge. Atlas’ 518 Digital Signal Processing class presented the foundation for students to succeed. According to Sonos Director of University Programs Susan Monaghan, UW EE students are a part of the next generation of thinkers and creators. This partnership offers UW EE students the valuable experience they need to succeed in industry. As designers and developers, students created mobile apps, embedded software, or new hardware smart speaker experiences. “Student innovations included using Sonos speakers to facilitate jamming and karaoke with your favorite tracks, reducing background noise, and determining which person is actually in a room listening”, said Real Industry Executive Director Jay LeBoeuf. A selection committee reviewed the 17 entries from over 60 students, and three teams were recognized with the top projects. Offering students an outlet to engage with industry has become a priority of UW EE. In 2015, the department launched its Engineering Entrepreneurial Capstone Program, which partners students with industry mentors on real-world research projects. This year, over 40 percent of the UW EE senior class is participating in the program, and the projects range from a variety of top areas, including health, transportation, security and communication.